Attractions like Exploratorium and Japanese Tea Garden make great kid-friendly stops. 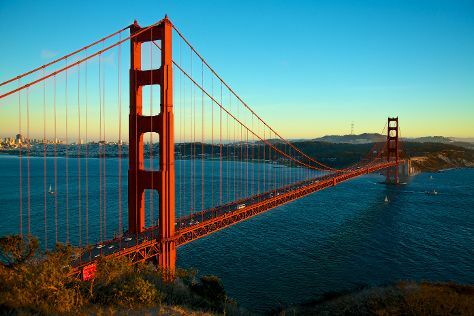 There's much more to do: snap pictures at Golden Gate Bridge, see the interesting displays at Cable Car Museum, take your sightseeing to a higher altitude at Twin Peaks, and engage your brain at California Academy of Sciences. To find photos, other places to visit, and tourist information, refer to the San Francisco trip itinerary website . San Antonio to San Francisco is an approximately 6-hour flight. You can also do a combination of bus and flight; or drive. Traveling from San Antonio to San Francisco, you'll gain 2 hours due to the time zone difference. When traveling from San Antonio in March, plan for little chillier days and about the same nights in San Francisco: temperatures range from 65°F by day to 50°F at night. Wrap up your sightseeing on the 10th (Sun) early enough to travel to San Antonio. Kick off your visit on the 11th (Mon): get a taste of the local shopping with The San Antonio River Walk, admire the natural beauty at San Antonio Botanical Garden, then contemplate the long history of Mission San Jose, and finally admire the architecture and history at Mission Concepcion. For ratings, reviews, traveler tips, and tourist information, read our San Antonio online attractions planner . Getting from San Francisco to San Antonio by flight takes about 6 hours. Other options: do a combination of flight and bus; or drive. Due to the time zone difference, you'll lose 2 hours traveling from San Francisco to San Antonio. Traveling from San Francisco in March, you will find days in San Antonio are somewhat warmer (76°F), and nights are about the same (54°F). Wrap up your sightseeing on the 11th (Mon) to allow time to travel back home.